Ability Office offers 3 core applications essential for home and business, Word Processor, Spreadsheet and Presentation, in one affordable office suite. Just perfect for working from home, allowing files to be edited and exchanged with those back in the office, and absolutely ideal for students. It’s so easy to get started with Ability Office Standard, thanks to its very familiar user interface. Create, load from, edit and save to Microsoft® Word, Excel, and Powerpoint. Gives you everything you need to create, edit and produce better-looking letters, reports, quotations, memos, mailings and newsletters. Write has all the features that you would expect from any top quality word processor — spell checker and thesaurus, bulleted and numbered lists, frames, tables, autocorrect, auto spell, headers and footers, numerous paragraph and font options, interactive rulers, intelligent drag and drop editing, shortcut menus for easy text revision, the capacity to include graphics, spreadsheets and charts, plus a whole host of other essential features. Write also supports a wide range of file formats for export and import and is compatible with *.doc and *.docx file formats (Microsoft® Office 2016 and earlier). In computing, an office suite is a collection of productivity software usually containing a word processor, spreadsheet and a presentation program. Everyone needs reliable office software, no matter if they are going to use it at home, office, schools or somewhere else. There are many office suites available, of which the most popular ones are Microsoft Office and Google Docs. But that doesn’t necessarily means that all other office suites are terrible. Ability Office is a lightweight office suite application, that comes with all the basic functionalities plus some added options that not all other similar suites offer. The small size compared to others, makes it suitable to run on the slower computers too. The download size is ~98MB, which might require a stable and fast internet connection. The installation process is simple and straightforward, and takes only a few minutes to complete. After the installation, you can see three new icons on your desktop, namely Ability Write, Ability Spreadsheet, and Ability Presentation. You can launch any one of these, and then activate the application using the serial code and your email. Once that is done, you can start using application straightaway. You can also launch the Ability Launcher, this stays in the system menu, clicking it you can access all the options from the context menu. The UI of the application makes you feel like it’s the older version of Microsoft Office. There is almost no difference in the UI, and it looks like a copy of the Microsoft Office. This can be good for users who are familiar with the arrangement of Microsoft Office, but it makes the software a copy with no originality. Ability Write is the application to deal with Word format files, and presents an overall simlar look to Microsoft Word with a few minor changes here and there. Ability Spreadsheets is the one that let’s you work with spreadsheets, and works like Microsoft Excel, where as the Ability Presentation is for presentations and is similar to Microsoft PowerPoint. Along with all the basic office functions like dealing with word files, spreadsheets, and creating presentations. This suite comes with Ability Photoalbum too. This application is a photo viewer that allows you to perform a few basic editing tasks too. You can crop, mark, resize, mirror, and rotate images, with also the ability to view them as a slideshow. – Comes with all the powerful tools to deal with word files, spreadsheets, and presentations. – Save documents in common formats including the ability to save as PDF. – Photoalbum is a handy edition, and allows basic editing. – Documents can be saved to Dropbox cloud. 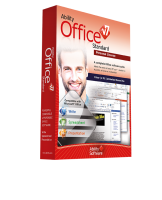 – It is many times cheaper than other Office suite applications. – Lacks originality, looks like a clone of Microsoft Office. – Ability Write does not show word count at the bottom. – It lags and slows down when typing in fast. Ability Office is an office suite that works well overall, it’s cheap price tag and the fact that it is lightweight makes it suitable for many types if users. The applications UI is a clone of Microsoft Office, but all the functions and options work well. It is definitely worth-trying. Ability Office 6 is easy to use, especially if you’ve ever had previous experience with Ms Office. Create documents with ease on Write and save them by default as .aww or in any other format you’d like including .pdf. Spreadsheet has over 250 functions with 25 built-in chart functions. You can do pretty much everything with it. For PowerPoint users, Ability Office 6’s Presentation lacks creativity and in its place you get a whole bunch of basic presentation options. For now, you may want to stick with PowerPoint. The first thing I tried to open is a spreadsheet with rotated text. Ability Office 6 can’t do it. Much disappointed. Hi CJ, we like to be as open as we can. We don’t support rotated text in cells. The nearest we get is a rotated textbox, which allows any rotation of text anywhere on the sheet – but not locked to individual cells. Downloaded, installed, entered registration key – no problems. Looks nice. I opened the Spreadsheet program to see how well they support macros (programming). Clicked to open Macro Editor and program crashed. It restarted after a bit, I created a new empty sheet and tried Macros again. The editor opened, I clicked the button to see the Class Library (I think that’s what they called it), and got the message “Exception occurred. Error Description: Bad browser info file format.”. Clicked ok, got another error message, clicked OK, got the Bad browser info file format error again. Clicked ok and an empty window popped up, that eventually filled in as I typed this. Off to a very shaky start, not sure I can trust this with my documents. Shouldn’t have these kinds of issues on revision 6 of a program that’s been around at least since 2004. I’m using Win 10. I hope the rest of the program(s) are better! Hands down, MS Office is the most powerful document editor. I came to this conclusion after trying out other document editors like WPS but wasn’t satisfied. However, I am always open to trying out new programs. That is how I came across Ability Office 6 and decided to give it a shot. I wanted to confirm if it could fulfil its promise of delivering a smooth document experience. Here is what I found. Right from the time I started using Ability Office 6, I noted its approach in trying to be a viable alternative to MS Office through its simplicity. Apart from the simplicity, the program is also reminiscent of older versions of MS Office. The resemblance goes a long way in ensuring you make a smooth transition if you ever make the switch. Be it this suite’s Write, Spreadsheet, or Presentation, the wide range of files types in which I could save my documents impressed me. In addition to this, the suite had no challenge in opening and editing documents created by other document creators. In case you want to send out your resume, you can easily save it PDF using such feature available in this software. Compared to WPS, this document editor was really lightweight. Even if you always save your changes as you work on a document, the program impacts minimally on your system’s performance. It goes without saying that most people are accustomed to the word count feature that is available in MS Office. However, if you switch to Ability Office 6, you will miss this feature. The only way to confirm the word count would be to head over to the Tools bar and clicking on Word Count. Having used MS Word for long, you might have become familiar with the Ctrl plus N keyboard shortcut for opening new instances of the program. The need to initiate a new instance usually arises when you want to work with multiple documents at the same time. However, Ability Office 6 falls short in launching new instances. That is, even if you have a current document, launching a new instance of the program automatically closes it without saving your changes. I ended up losing my content when I started using this program and it was frustrating. In case you fired up a new instance of this word editor before saving your work, you need to close the newly launched instance for it to prompt you whether to save or discard your earlier changes. I registered this version of Ability Office 6 after installing it. However, I noted its repeated prompts requesting me to register it every time I launched it. These prompts were bothersome given the fact that the program indicated it was registered after I chose the “Continue without registering” option. Ability Office 6 can offer a good alternative if you really want to switch from MS Office. It boosts of a wide range of features of which you can take advantage. The most striking feature though is its compatibility with a large number of document file types. It also lightweight. – I think we have got to a good stage when the first comment on the UI is the missing ‘Words’ display. But you are right. We will add this to the list of UI features for consideration in the next release or two. – I hadn’t noticed this problem of secondary instances potentially losing data in unsaved open documents. I have just tested this with v6 on WIN10 and an old Vista PC and all works as expected, including with unsaved files. The two instances of the application just run alongside each other. Not sure what you experienced there. In general we support normal multiple document interface and are compliant with Windows practices. – Yes, registration can be a frustration, apologies. There are two types of connection – Activation & Registration. Activation with Serial Number is required to keep the product running beyond 30 days. Registration is just creating a ‘user’ record on our server side. You don’t actually need to register. Activation is prompted every time you run any of the apps until you actually activate. Registration is prompted every time you run an app until you turn it off – by clicking the “Don’t show again” checkbox and submitting. I hope that has helped a little to understand what’s happening. Completely unacceptable behavior is version 1.0 of ANY program, never mind Version 6. Ability Office 6 is an impressive office suite that performs exceptionally well on simple document editing and presentation tasks. It is lightweight and fast which makes it a great software to anybody who is mindful of space, needs a word processor for a slow computer, or both. However, after using Ability Office 6 for quite some time, I don’t find it to be a replacement of Microsoft Office. It is, rather, a good tool for those who don’t use advanced features such as tracking changes and password protection in word processors. Ability Office 6 is very fast and sleek but lacks originality. It kind of looks like the older Microsoft Office versions which is a bit questionable whether the developer was creating a Microsoft Office clone or an independent software. All the basic functions of office are included on the menu almost exactly the way you’ll get them in Ms Office. In Ability Write, the footer shows the date the document was modified, the zoom percentage, the number of characters, pages and lines. Unlike in Word, the find feature is situated on the right side. There’s a wide range of fonts and graphical editing tools too. Ability Spreadsheet will look familiar to Excel users while Presentation is a minimalist version of PowerPoint. Ability Office 6 comes with Photoalbum, a basic photo editing tools that allows you to crop, mark, and resize images. It won’t do much but it is pretty helpful for basic tasks. •	If you were to buy, you’d only spend a fraction of Microsoft Office’s price. •	Applications lack some essential features. 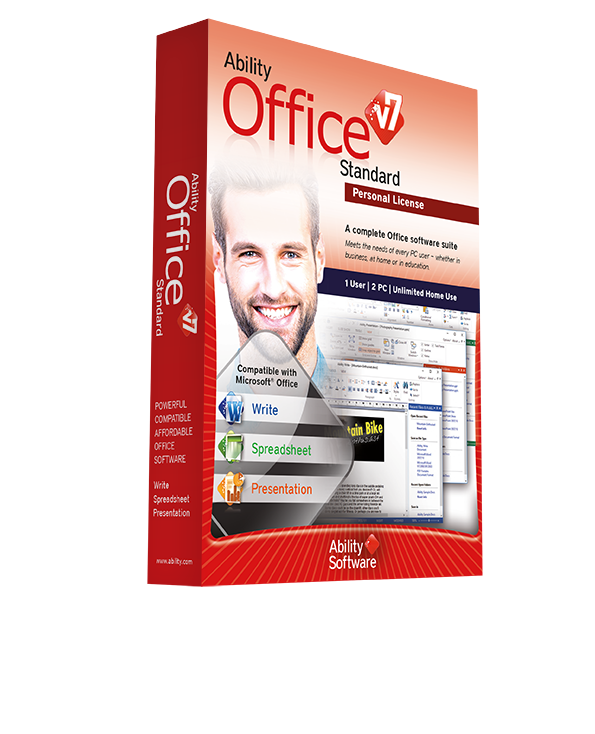 Ability Office 6 offers the most essential functions that you’d need in an office software. It even provides some additional features that will improve your experience. However, it lacks a handful of features that are necessary in any standard word processor. Isn’t that the point; being compatible with Office??? You were talking about small businesses. Pls. keep in mind, this offer is for non-commercial use only.